Medicine recycling is defined as the process of gathering, sorting, and storing unused medicines before their expiration date, discarding what is no longer viable, and redistributing these medications to non-US territories as humanitarian aid. Since 1996, the AID FOR AIDS (AFA) HIV Medicine Recycling Program has been a pioneering and essential program that collects unused and unexpired HIV medicine in the US to recycle and redistribute it to people with HIV in the developing world with no access to treatment. Over 37 million people are living with HIV around the world and over 40% still lack access to treatment. The HIV Medicine Recycling Program is designed to reach people with HIV who are on treatment and who may have unused and unexpired medicine that they no longer need. AFA reaches this population through community-based organizations that support the HIV community, medical centers and health care providers, and even directly through advertisements or mailers. Antiretrovirals: Protease Inhibitors (PIs), Nucleoside Reverse Transcriptase Inhibitors (NRTIs), Non-nucleoside Reverse Transcriptase Inhibitors (NNRTIs), Entry Inhibitors, and Integrase Inhibitors. AFA formally enrolls people with HIV in the developing world into its treatment program. Their healthcare provider conducts appropriate clinical monitoring and follow-up. AID FOR AIDS accepts all unexpired antiretroviral medicine as well as all medicine that may be useful to manage co-morbid conditions in people with HIV. AFA will accept bottles that have been opened as long as the medicine is still unexpired. AFA accepts sealed containers of liquid and powder medications, and both sealed and unsealed containers of pills. If you live in the New York Metropolitan Area, please check the list of drop-off points available in that area to avoid incurring packaging and shipping expenses. Please remove the names and addresses of all individuals from prescription bottles in order for us to comply with privacy and confidentiality laws. Always leave name of the medicine and expiration date visible. Please place all pill bottles in a (sealable) plastic bag and place this bag inside a padded envelope or cardboard box. All pill bottles should be securely closed. Please: do not send any loose capsules or tablets inside a plastic bag or box! 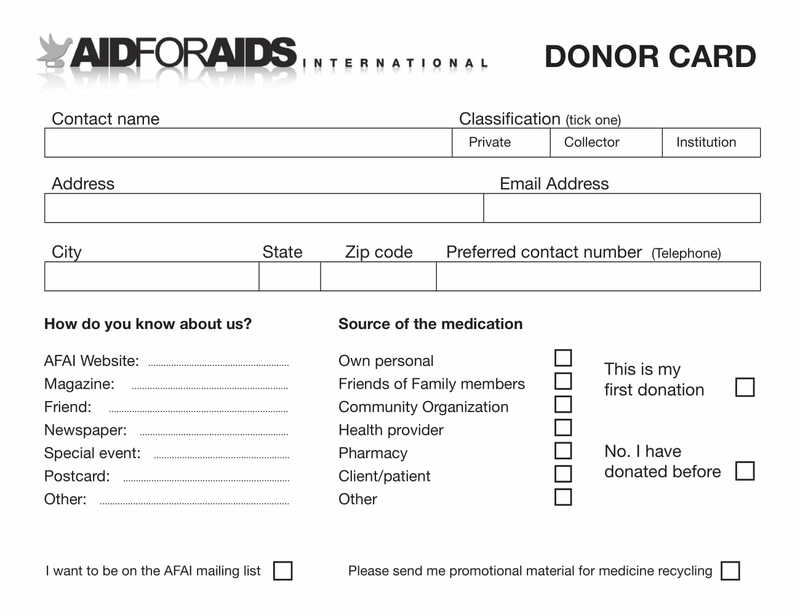 Please fill out the Donor card, print it, and place the card inside the envelope or box. If you would like to keep your donation anonymous please still fill out the other information requested which enables us track donations and monitor trends. We welcome having health care providers who are willing to be Medical Ambassadors for our program and who are willing to promote the program in their medical center and/or with their patients and in turn also collect medicines on our behalf. AFA can provide brochures, posters and other material to use in their facility and to hand out to patients. Health care providers are encouraged to remind their patients to donate their unused medication to AID FOR AIDS. A Medical Ambassador can either collect the medicine to send it to us or they can let patients know where to send it to AFA. Over 80% of medicine donations to AFA come from individuals. To facilitate collection for individuals, we’ve established a series of drop-off points at specific community-based organizations, pharmacies and other facilities. These are facilities that offer a medicine drop-off box that allows people with HIV to simply drop off their medicine and avoid having to ship it us. These organizations also actively promote our program with their community. Let us know if you work at a community-based organization, medical center or other agency that deals with people living with HIV and that has a high-enough potential of medicine donations to warrant having a medicine drop-off box. What does AFA do with the donated medicines? AFA currently offers antiretroviral (ART) treatment to more than 550 people with HIV (mainly in Latin America and the Caribbean) who would not otherwise have access to treatment. All donated medicines are sent directly to people with HIV and/or their healthcare providers in their countries. AID FOR AIDS has established ongoing relationships with both doctors and people with HIV in order to ensure proper use and continuity of care. What medicines does AFA collect? We collect and recycle all antiretrovirals in both adult and pediatric formulas and dosages. We also collect and welcome donations of medicines to prevent and treat HIV-related opportunistic infections (“OIs”), such as antibiotics, antifungals, and other antivirals (e.g., for herpes infections). We welcome medicines used for HIV wasting disease and for side-effects management (e.g., for peripheral neuropathy, lipid lowering drugs) and medicines for any HIV co-morbid conditions including hepatitis C, elevated cholesterol, diabetes, etc. Does the U.S. government allows donated drugs to be sent abroad? All donated medications are distributed outside the United States as humanitarian aid. For more information, see the World Health Organization’s “Guideline for Drug Donations” at: Department of Essential Drugs and Other Medicines, World Health Organization, 1211 Geneva 27, Switzerland. Does AFA accept medications past their expiration date? Do I need to do anything to the bottles before I send them? To comply with applicable legal structures and to respect the confidentiality of people with HIV, we kindly request that you remove the names and addresses of all individuals from prescription bottles. What if the medicine requires refrigeration? Please refrigerate these medications once in your possession and keep them refrigerated until the day they are mailed. If you are sending cold-storage medicines, please send these medications Priority Next Day Air in order to keep the medication from deteriorating. No dry ice or cold packs are required for cold-stored medications. I live or work in the New York City area. What is the best way to get the medicines to you? I live outside the New York City area. What is the best way to get the medicines to you? If you are mailing cold-storage medicines, please mail these medications Priority Next Day Air to avoid the medication from deteriorating. It is acceptable to put both cold-stored and non-cold-stored medications into the same box for shipping. No dry ice or cold packs are required for cold-stored medications. What if I cannot afford to send you the medications I have? We can also arrange with FedEx to pick up donation boxes, if you or your organization is not able to absorb the cost of shipment. If you need to arrange a FedEx pick-up, please contact Leonardo Klie calling: (212)-337-8043 or emailing: LKlie@aidforaids.org to help you. If you have additional questions about how to make your donation, please take a moment to fill out this form completely. This information will be used to contact you and ask you more detailed information about your donation or answer your questions.